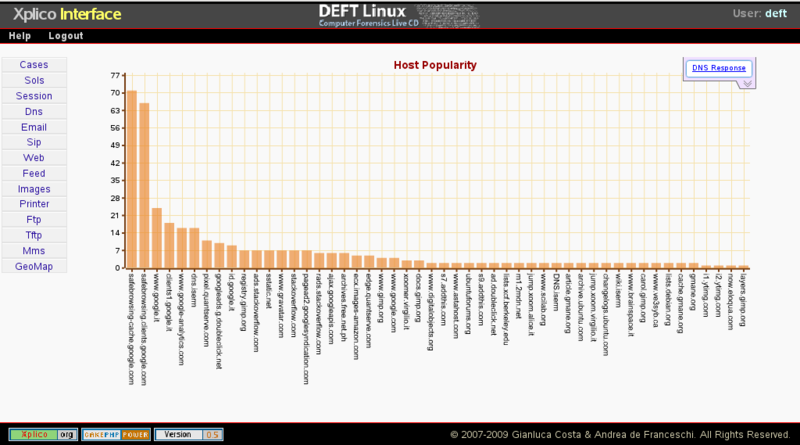 We are pleased to announce the DEFT Linux 7 and the new release of Xplico. We are working to 1.0.0 version and you can try it here. If you are a fun of Xplico, please vote for it 2011 Toolsmith Tool of the Year. You can found Xplico 0.6.1 in DEFT Linux 6 and you can download VirtualBox.org image, source code and Ubuntu 10.10 package here. This release introduces improvements in the SIP and RTP dissectors. In this version was also added the RTCP dissector, with this dissector Xplico is able to obtain the phone numbers of the caller and called party (obviously only if present in the RTCP packets). DEFT 5.1 Live distribution contains this version. You can download source code and Ubuntu 10.04 package here. You can find this release in DEFT Vx5 Linux distribution. You can download source code, Ubuntu 9.10 package and VirtualBox.org image here.